Medical procedures span such a vast spectrum. A simple peripheral IV placement often requires no anesthetic whereas complex cardiovascular surgeries warrant carefully administered general anesthetics. Procedures like external reductions of limb fractures, laceration repairs, colonoscopies, cardiac catheterizations, etc. have tremendous variability in terms of how to administer narcotics, hypnotics, and sedatives. Cooperative, calm patients routinely get by with minimal sedation whereas patients with significant comorbidities might require full general anesthetics for the exact same procedure. 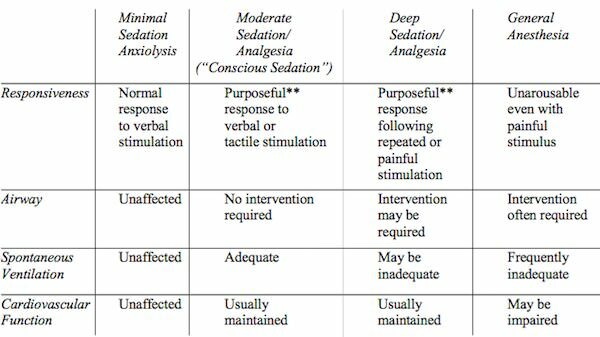 In the perioperative arena, the terms “MAC” (monitored anesthesia care) and “sedation” are used interchangeably; however, they are not the same. The term MAC has nothing to do with levels of sedation (minimal, moderate, deep, and general anesthesia). The MAC provider must be prepared to convert to a general anesthetic at any point during the procedure and rescue the airway from compromise. The take home message is that “MAC cases” must involve a physician who can utilize a wide array of resources to ensure patient stability and safety (rescue an airway, convert to a general anesthetic).